It’s very nice that values achieved a gain of .013% in October, but we still have a 30% fall ahead of us and, as you know, we have a 30% fall behind us. Better send in your mortgage payment. The S&P/Case-Shiller Home Price Index released Tuesday is up 5.6% from April. Besides the movement up since April, the severity of the annual decline has steadily decreased in the last nine months. October prices of real estate were down 6.4% from the previous year. January prices this year were down more than 19% from the year-earlier period. “All in all, this report should be described as flat.” says David M. Blitzer, Chairman of the Index Committee at Standard & Poor’s, the publisher of the index. Average home prices are now equal to prices in Fall 2003. The headline estimate of a 30% fall still to come is based upon a trend line derived from data between 1987 and 2000. The presumption is that the values after 2000 are bubble values and that they should be excluded. If you think this can’t happen, consider Las Vegas. They have naked dancing girls and values which are still up from January 2000. The gain is all of 5% from that time. Now that 5% up isn’t as good as it used to be over there. At one time our desert community swam in real estate appreciation of 135% from January 2000. Most professionals refer to the Vegas real-estate investment environment as whiplashy. We are in a Goliath versus Goliath match. The multi-prong attack against falling prices by the United States government includes radical intervention via Fannie Mae, Freddie Mac, FHA, the home-buyer tax credit, the purchase of mortgage-backed securities, the purchase of treasury bonds, and the provision of an equity credit line at Fannie and Freddie — the mortgage monsters who will lose more money than any institution in the aftermath of the financial crisis. Well, somebody might lose more in some version of an infinite loss in the derivatives market. 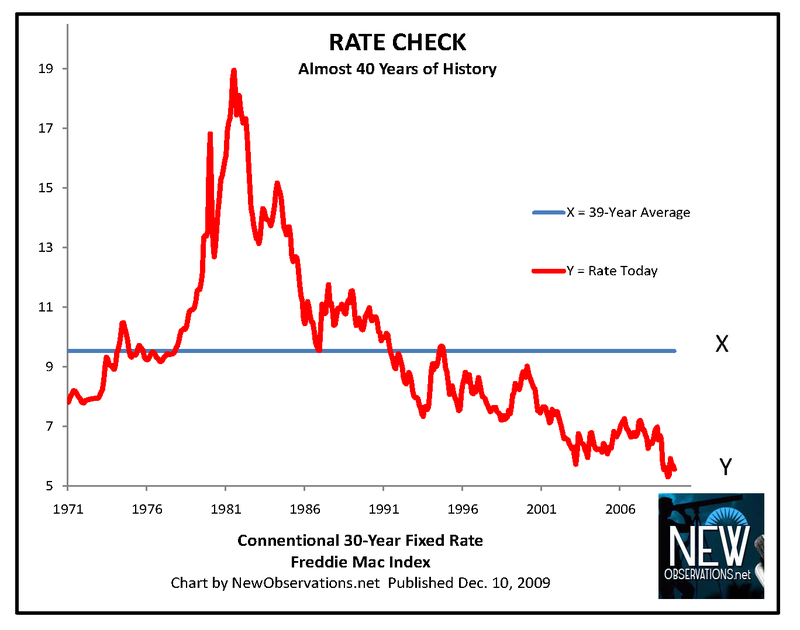 Maybe Fannie and Freddie can come out ahead – of somebody? 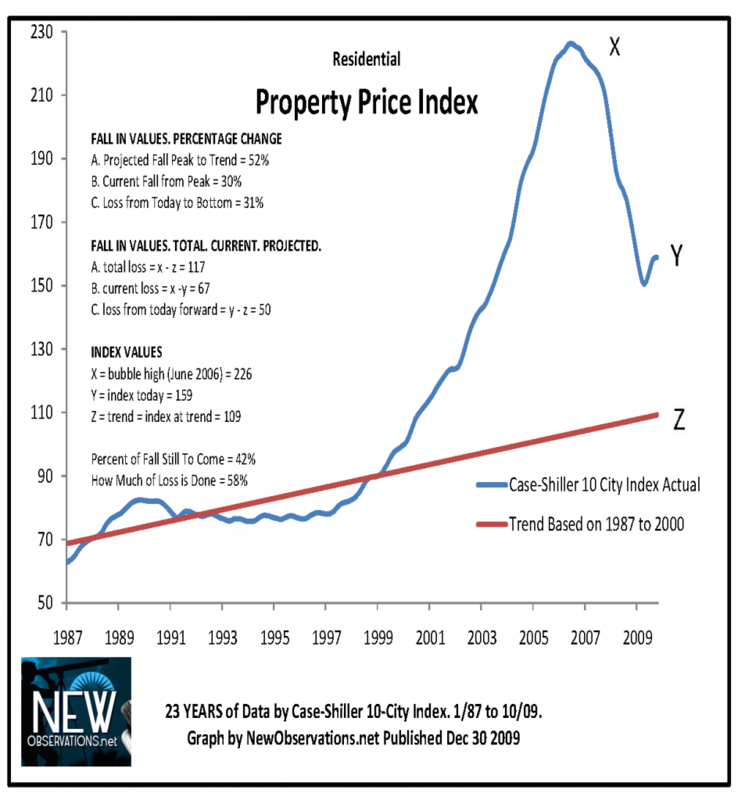 We may have even hit a bottom in real estate prices. With interest rates at zero percent, the people who can borrow borrow for free. If you can borrow and it costs nothing, that’s a darn nice way to try to make money by borrowing and buying. Our government policies are replicating the method of creating a credit bubble. If real estate values don’t return to a norm, it means that a new breakable bubble is gathering strength. Fraud begets fraud. Only failure will end the fraud, and given the heroic effort required to quiet the current crisis fear, the failure we are building cannot be measured. It’s too big too count. IF the economy was healthy, we could expect prices to fall 30% as you projected. But in a depressed economy, we could expect them to fall even farther. I’d say 30% is the right number. Should be 40% but the Government will probably come in a subsidize buyers a bit, bringing it back to the 30% drop.